Our latest review for SpinMaster is an updated version of the DR1 Racing Drone, with the addition of the First Person View (FPV) headset and a camera on the drone itself. Really very steady and easily-controlled, it's a great introduction to drones and indeed FPV, although is recommended for age 10+ because obviously drones can be dangerous and need to be used sensibly. Instantly I was really impressed as the box is awesome. 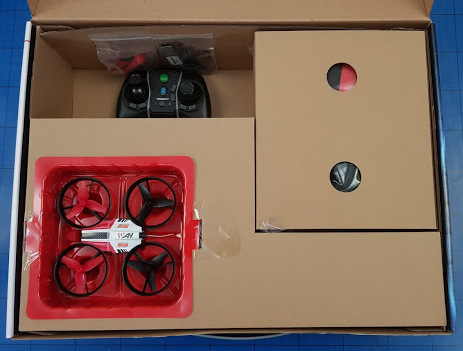 It's a properly sturdy re-usable box that can store your drone, controller, charging cable, spares and headset/goggles for their lifetime. This is Christmas-morning friendly and easy to unpack in seconds. Obviously your drone will need charging before you start (via USB for 30 minutes) and you'll need 3 x AAA batteries for the controller (not included). The drone itself is the familiar looking DR1 red, white and black, but slightly bigger than the AirHogs DR1 micro drone we reviewed last year at 10.5x10.5x3cm, and obviously the technology is improved, plus there's the addition of a camera. The drone itself is incredibly robust. We did fly ours into the Christmas tree and spray tinsel everywhere, among about 500 other crashes, but no damage as yet - not even a replacement blade. Charge time is brilliant - 7 minutes play for 30 minutes charge. The camera image is excellent. Real-time using a phone and it is recordable as either video or photos. Range is great - 250ft - although we have only been able to play indoors as yet due to the weather. 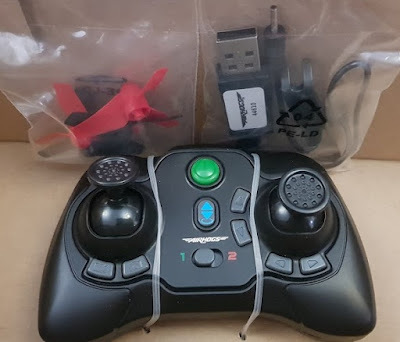 The drone is so small and easy to control that flying inside is very doable. FPV does take a lot of getting used to, but once you do then it's brilliant fun and you can take a good look at your house from a completely different angle. 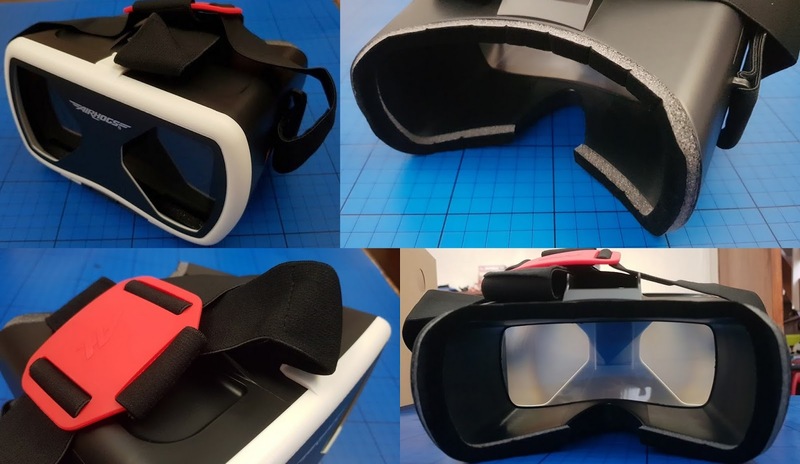 The headset is really comfortable with an incredibly soft strap and padding, and it has loads of adjustment for people of all sizes. You will need your own smartphone though. Take a proper look with our video. Please excuse the mess - it was Christmas! 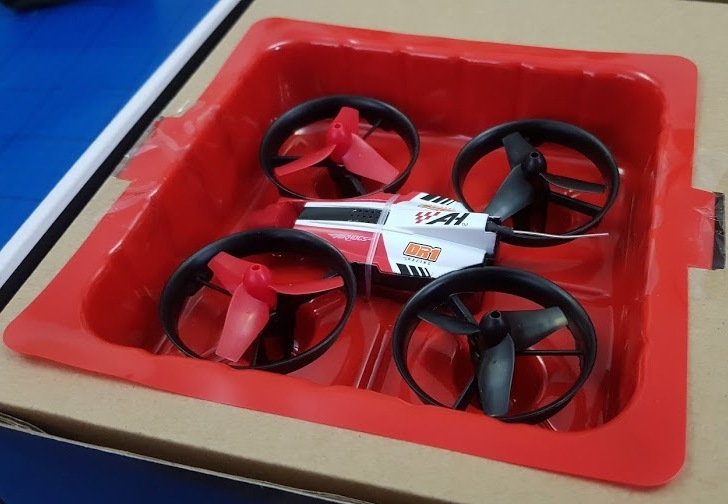 We really like the AirHogs DR1 Racing Drone. It's easy to use, but offers plenty to a more experienced drone pilot. The fact it's so comfortable indoors and can also go outside when the weather is better is a real bonus. The technology for the money is very impressive. This is unlikely to disappoint any newer or younger drone flier. The 10+ age recommendation is cautious, my almost 8 year old has had a little go and he was okay with it, although lacks confidence yet. The AirHogs DR1 FPV Race Drone is available to buy now priced £99.99rrp, from toy shops instore and online, including Amazon. 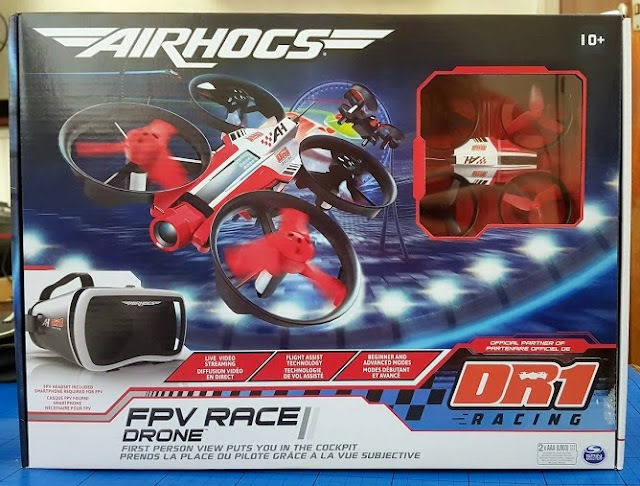 We were sent the AirHogs DR1 FPV Racing Drone for review. Amazon links are affiliate, but I see no better price currently.